Activity at the cricket ground started on Friday 3rd August. Helpers started to arrive from 9 o'clock onwards, all keen to get this year's fete underway. With borrowed tables from Hurstbourne and Wherwell, our 'treasures' from the village hall and the colourful tents from Bournemouth, the team started work in setting out the fete. Fortunately, the weather was in our favour, apart from a strong wind, which seemed determined to move some of the tents. All was set up by mid-day apart from the marquee, which we borrowed from the 6th Andover Scouts; this arrived with a willing band of volunteers to erect it. Should you ever require a marquee of such dimensions they are always willing to hire it out to boost scout funds. Saturday dawned clear and bright. Optimism about the forecast was high, hoping for a rain-free day (more about that later). Sally Taylor of South Today opened the fete and then spent time going around the stalls talking to stall holders and visitors. The Reverend Coppen was also introduced to the assembled crowd and later Nona Harrison thanked everyone for their support. Apart from the usual stalls, we were entertained by Dodgey The Clown (Stuart Ashman from Bristol a professional entertainer). He did a half hour show, then helped with the children's races ,much to their pleasure, and later he mingled with the visitors. The bottle stall was as usual a great attraction along with the Grand Draw. The various sideshows according to their takings seemed to attract equal attention. The Bric a Brac stall was also popular, being besieged with eager buyers, even before it was open, keen to know why they had to wait for the official opening! Once again we were entertained by the Gosport Silver Band who are always well received. As the afternoon progressed the storm clouds gathered. About 3.30 rain was felt and by 4.0 o'clock there was a torrential downpour. Until then the Band had played on, rather like the orchestra on the Titanic but sadly they had to abandon the field. It was then that the true British spirit was apparent. Time to announce the competition winners and have the Grand Draw. 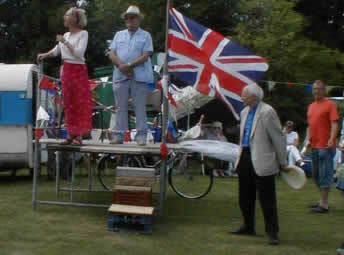 John Jackson on the announcer's rostrum was surrounded by a mass of colourful umbrellas as he announced the winners to a much-depleted but hopeful audience, who cheered the news that Stuart Bevan who has done so much for the fete and the village had won first prize. The fete was over but not for everyone. Time to clear up. Understandably people were rather reluctant to wait around in the pouring rain so there was only a small band of volunteers who paddled across the field dismantling tents and tables, which ultimately had to be returned from whence they came. Despite the abrupt ending to the proceedings, we managed to raise just over £4000 towards church funds and the village hall, a splendid effort by everyone. On Sunday helpers were invited to John and Wendy Ellicock's to hear the results of their efforts and the sun shone. Finally I would like to thank everyone involved in the fete. Whatever part you took, all your efforts are greatly appreciated. If you have not been thanked personally I apologise but we have tried to remember everybody.